Embedded test function detects incorrect wiring and automatically corrects CT installation errors. The DIRIS A-10 is a DIN-rail mounted multifuntion power monitoring device for low voltage electrical installations. Compatible with 5A secondary CTs. 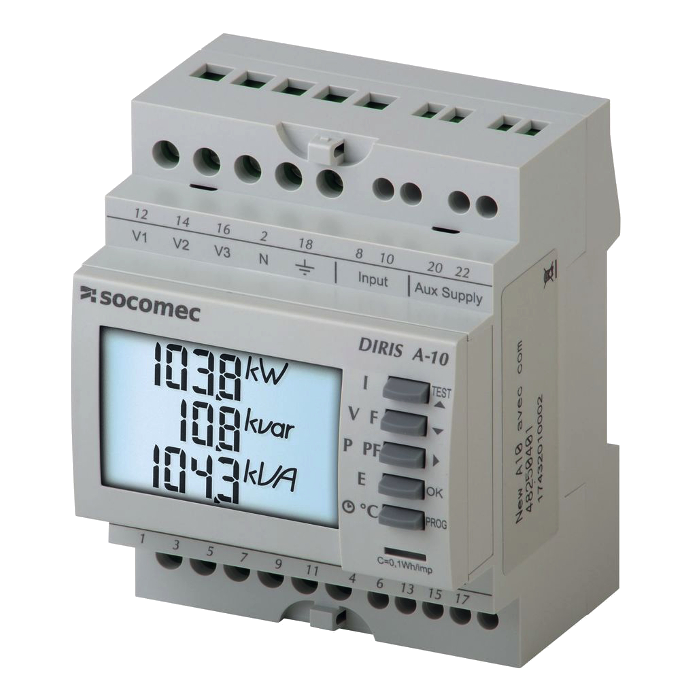 The A-10 has 1 digital input and 1 digital output for additional versatility and exists with serial Modbus RS485 communication to report all measurements to an Energy Management System. Five direct access pushbuttons enable all measurements to be clearly viewed on the backlit LCD display. An integrated test function can be utilized to detect incorrect wiring and to automatically correct CT installation errors.